The Wall Street Journal reported that the Gross Domestic Product grew at a seasonally adjusted annual rate of 0.1% in the first quarter of 2014. The article in the Wall Street Journal explains some of the factors responsible for the low economic growth. Some suggested causes were the extremely cold winter which slowed consumer spending, and the sudden drop in exports, declining at a 7.6% pace in the first quarter. Obviously, this is not the robust economy the President has been claiming. The GDP estimate released today is based on more complete source data than were available for the “advance” estimate issued last month. In the advance estimate, the increase in real GDP was 3.2 percent. With this second estimate for the fourth quarter, an increase in personal consumption expenditures (PCE) was smaller than previously estimated. 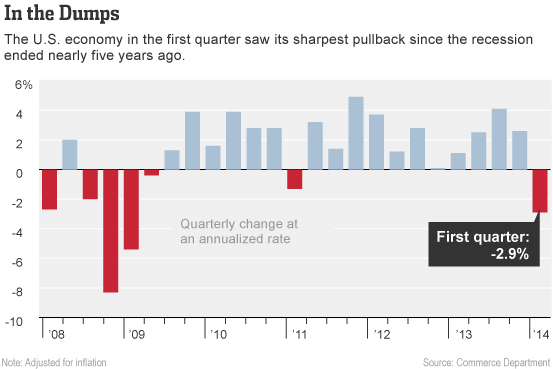 Consumer spending was cut to a 2.6 percent rate, still the fastest pace since the first quarter of 2012. It had previously been reported to have grown at a 3.3 percent pace. Consumer spending, which accounts for more than two-thirds of U.S. economic activity, contributed 1.73 percentage points to GDP growth, down from the previously reported 2.26 percentage points. As a result, final domestic demand was lowered two-tenths of a percentage point to a 1.2 percent rate. The loss of momentum appears to have spilled over into in the first quarter of 2014, with an unusually cold winter weighing on retail sales, home building and sales, hiring and industrial production. Weather will be a factor in 2014 Q1, but it wasn’t in 2013 Q4. The economy was stagnating well before the polar vortices arrived, and has been ever since the June 2009 technical recovery. This is just more of the same. 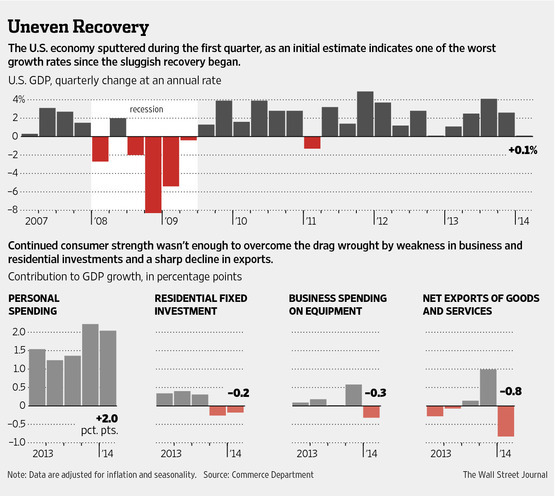 President Obama’s economic policies are not working. Can we please try something else?